A fundraising campaign to bring home the body of a Scottish Muay Thai boxer who died in Thailand has reached almost £20,000 in its first day. Jordan Coe, 20, who was originally from Maddiston near Falkirk, is believed to have died from heatstroke. He had been due to fight Khon Bola, a Cambodian boxer, in the Muang district of Thailand on Sunday night. Friends of Mr Coe believe he may have been trying to lose a final few pounds in weight before the bout. His mother Lisa is expected to fly to Thailand on Tuesday. Mr Coe's close friend Liam McKendry, who trained with the boxer in Thailand, told BBC Scotland he was "still in shock" at the news. He said: "It was only Wednesday I was talking to him. "I'm still trying to process that he's passed away." Mr McKendry said he was told of his friend's death on Sunday morning. He said: "I just didn't want to believe it. "I was trying to think of every possibility that he's got it muddled up, it's not Jordan, it's somebody else. "It wasn't until I messaged Jordan's mum that I found out it was actually true." 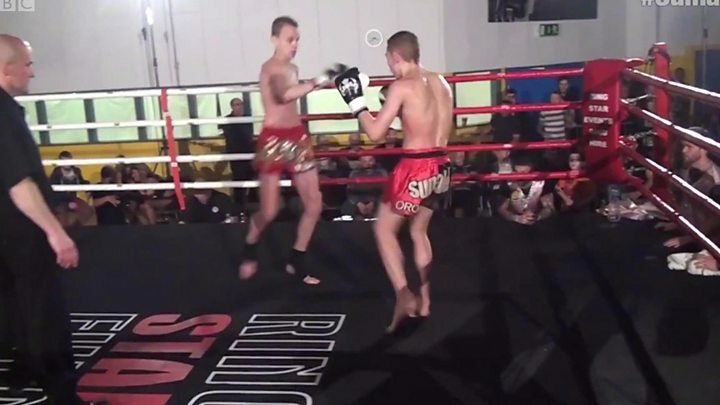 Mr Coe began fighting at a gym in Grangemouth and later trained in Glasgow before moving to Thailand three years ago. Coach Craig Floan from the Glasgow Thai Boxing Academy said Mr Coe was a "very, very fit young man" who "trained to the absolute max." He said: "The Thais loved him because he went over and learned their language, learned their culture." "There was nothing out of the ordinary that he did here or in Thailand, just trained extremely hard. "We think he went a run to lose the last couple of pounds for the fight he was meant to have yesterday and he's not made it home."